The Ideal Fiber Link for POV Cameras Positioned Around Stadiums, Arenas and Race Tracks. The HD–3521 is the ideal fiber link for POV cameras positioned around stadiums, arenas and race tracks. In addition, the HD–3521 is ready to capture the city skyline and highway activity when HD cameras are used to produce broadcast–grade video. Both the standard 1.5Gb high definition video signal for 720P & 1080i production and the 3G HD signal for 1080P makes this link able to handle today’s cameras and ready for tomorrow. 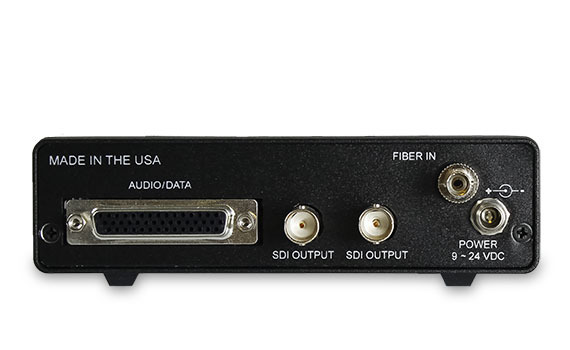 The input SDI signal is equalized for cable compensation and re–clocked with a loop–through for local monitoring or camera output verification. Back in the control room, the cost of SDI DA’s is averted with the dual HDSDI outputs on the HD–3521 receiver. Stand–alone or 1RU rack mount panels offer system designers flexibility in the implementation. The two–channel, two–way data system handles camera control and PTZ signals for the robotic head. 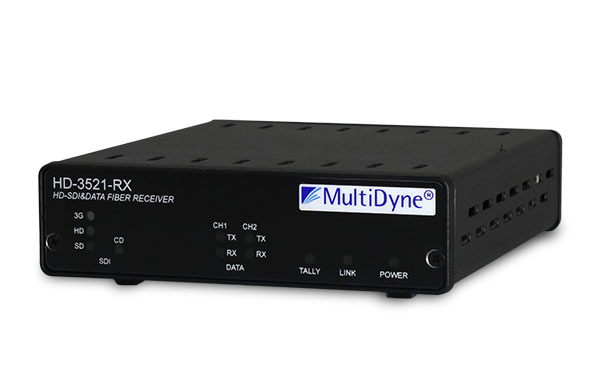 Installers can select RS–232, RS–422 or RS–485 data formats. Each of the POV cameras can be equipped with an “On–Air” Red Tally light as the HD–3521 supports this signal as well.